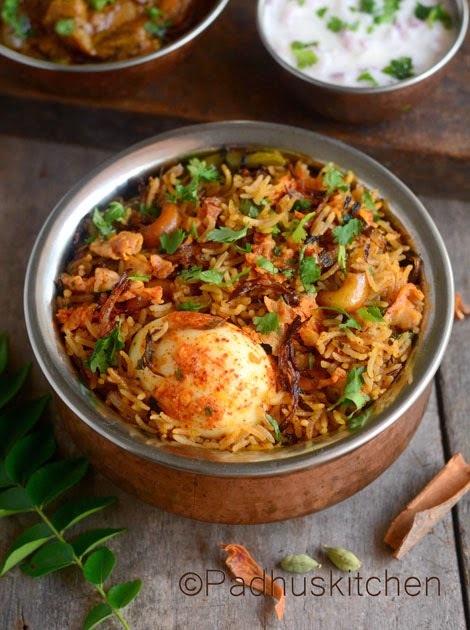 This egg biryani is a great treat for egg lovers. It is very easy to make and does not take much time once you are familiar with the recipe. Apart from hard boiled eggs, I have also added scrambled eggs to this biryani, which makes it even more delicious. Though I am not very fond of egg dishes (except omelets and egg scramble) my kids love eggs and I love to make it for them. 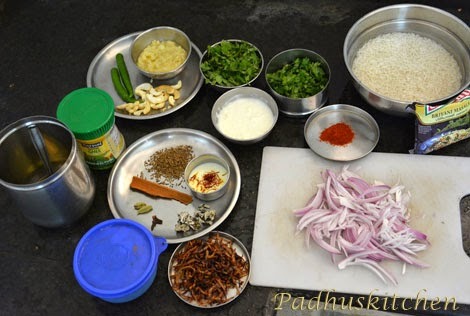 Today we will learn how to make egg biryani following this easy recipe with step wise pictures. Wash and soak Basmati rice in water for 30-40 minutes. After 30 minutes, drain the water completely and saute basmati rice in a tsp of ghee for a few seconds. This step is optional but adds flavor to the biryani. Cut onion lengthwise and keep it ready. Wash and finely chop mint and coriander leaves. For Fried Onions - Cut onion lengthwise, dry it a little and deep fry in oil on medium flame until brown. Soak saffron in a tbsp of warm milk. Heat oil + ghee and add the ingredients mentioned under seasoning. After cumin seeds sizzles, add thinly sliced onion and saute until it turns golden brown. Add salt to speed up the process. Add cashew nuts, slit green chillies and saute for a few more minutes. Add ginger-garlic paste and saute until the raw flavor of the ginger goes. Add mint and coriander leaves. Add chilli powder, turmeric powder, biryani masala, garam masala powder and salt needed. Saute well on medium flame until the raw flavor of the spice powder goes. Add yogurt/curd and cook for a further 3-4 minutes. Add fried onions and mix well. Add 1 1/2 - 1 3/4 cup of water. When water starts boiling, add basmati rice. Mix well and cook covered. Check for salt by tasting the water. If it is slightly salty, it will be perfect once rice is cooked. When rice is three fourth done, you will see holes appearing on the surface. Add a tbsp fried onions, coriander leaves, mint leaves kept for garnishing, saffron soaked in milk and a tsp of ghee. Reduce the heat to low and cook covered for another 5 minutes or until all the water is absorbed and the rice is soft. Hard boil 2 eggs, peel the shell and keep it ready. 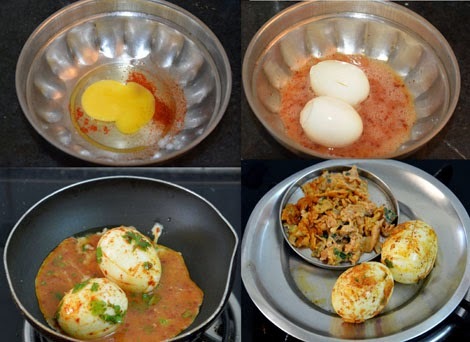 In a bowl, break an egg, add chilli powder, salt need and gram flour (besan/kadalai mavu). Mix well. Make 3-4 lengthwise slits on the boiled eggs. Coat the egg in the above mixture. Heat a tsp of oil and add the mixture along with the coated boiled eggs. Add finely chopped coriander leaves and cook until the mixture scrambles. Add the hard boiled eggs and the egg scramble to the rice and mix well gently. Serve hot with onion raitha. I served with onion raitha and Brinjal Masala Muslim style. The combination was awesome. Wow. .just reading the recipe made my mouth water! The pictures look awesome Padhu. how do I cook this biryani in rice cooker? 1.You can do the same steps as mentioned above directly in the rice cooker . or 2. you can do it in a kadai, then after adding water, transfer the contents to the rice cooker and switch it on. Check in between. As the rice is soaked for 40 minutes, it gets cooked within a few minutes. hi padhu, how the dish tastes without milk and saffron ? Thank you for this awesome recipe. Could you please share the brinjal side dish as well? Would love to try it together. Thanks !! Tried this for lunch today... Awesome recipe. Loved making it and people loved eating it! 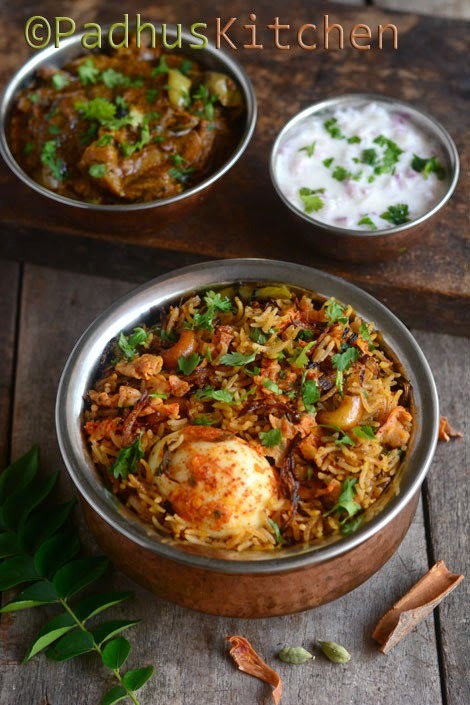 Total hit-like a restaurant style Biriyani. Tried it today. Came out well. Very easy to prepare as well. I mostly use the pressure cooker or hindalium kadai. You can use any heavy bottomed vessel with lid to make biryani. Oh this looks so good! What is biryani powder? Biryani masala powder is a blend of whole spices.The spices are roasted and powdered.You will get it ready made in the market. You can also prepare it at home but I have not yet posted the recipe.For this recipe, I used only ready made biryani masala powder. Perfect! It tasted delicious and everyone loved it! So easy too and can make it in no time. A very satisfying lunch. I skipped the saffron as I did not have any at hand and did not add fried onions either as I burnt them;) Also I used whole spices instead of biriyani powder. Next time I might make some biriyani powder by dry roasting them and grinding them. Still the end result was yummy:) The coriander and mint leaves add lots of flavor. The recipe is a keeper. Thank you. Fantastic recipie! Made this for lunch today and the biriyani was spot on! Thank you for sharing this :) This is the first recipie of yours that I tried, will definitely do more! Simply fabulous! Loved it. Thanks Padhu. If i want to increase the rice quantity by two cups, do i double the rest of the ingredients? Hi. Following ur blog for many recipes. U r too good. Thank u. For egg biriyani tomato s optional r should not add. Can we do n a big nonstick kadai. I have not added but, if you want you can add 1 tomato. You can cook covered in any kadai or pan. Hey. I really like this recipe and I wanna try it for my mom's birthday but, I have a big family with six people and I don't know how to double or triple the recipe. Can you help me? Just multiply the ingredients by 3 to serve 6 people. But it serves more than 6. Adjust seasonings to your taste. This recipe is wonderful! I've tried it many a times and it's always turned out great. Very tasty. I usually add vegetables to the biryani. Thank you! Hi padhu,I tried this recipe today and it was awesome.no words to describe. Out of the world. My husband too appreciated today. Thank u. Thanks for sharing the recipe. This egg biryani is my husband's new favorite. Hi Padhi.. Thanks for sharing this recipe.. It really came out well & was tasting different & good too.. Can you please share the recipe of spicy chicken biriyani (Andhra Style).